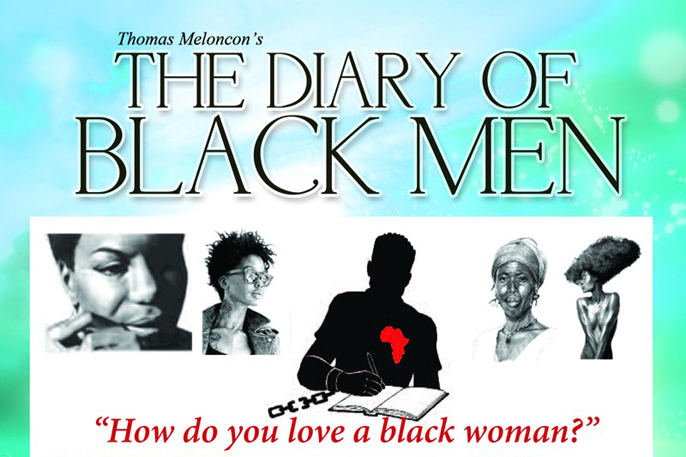 The phenomenon known as "The Diary of Black Men" is an exciting and tantalizing theatrical production that has played to sold-out audiences in America and England for nearly a quarter century. Written by Houstonian Thomas Meloncon, this choreo-poem is the longest touring and most successful stage play in black theatre history. The plays subtitle "How Do You Love a Black Woman?" provokes thoughts of a historical nature and magnitude. Originally penned in the late 70's, this newly updated version addresses the issues of love, trust and black family values that have long been discussed cross-culturally, by economists, politicians, theologians, social scientists and the like, thus making the black man, in the words of Mr. Meloncon, "…the most talked about animal in America." This observation could very well be the catalyst that has consistently packed venues in every corner of this country and abroad. The play attempts to address that statement and the aforementioned question of black love through a series of vignettes and scenarios examining the relationships between Black men and women using six male stereotypes: The Player, The Blue Collar Worker, The Militant, The Wall St. Brother, The Black Muslim and "Slick" The Hustler. The show passionately combines prose, poetry and dance that complements each other in a highly dramatic style. It is a revolutionary piece that delivers art and social commentary creating an emotional response from its audience. It opens with the men perched upon pedestals in tableau. As the warm specials individually illuminates the men, they all, being true to their stereotype and character, offer their pitch to impress the lone female character in the play. The Muslim for instance, offers protection, but with it goes submission. "Come my sister, learn your place as my wife." The Player, a glib smooth operator claims, "I am all man, from head to toe." The Working Man boasts that he "always supports his family." The Militant says he's "not the problem but he is the solution." The Intellectual claims to possess "the three main ingredients any Black woman seeks in a Black man: education, intelligence, and a solid bank account." Slick, a new-age pimp, promises a better way of life brimmed with excitement and romance. The plays' one female character is an exceptional dancer, represents Black women but has no speaking part in the production. The cast includes Russell Andrews (The Player ‘Slick’), Oris Erhuero (The Muslim), Clayton LeBouef (The Militant), Edwin Lee Gibson (Blue Collar Man), Lawrence Gilliard Jr. (The Lover) and Daryl Keith Roach (The Wall Street Brother) and female lead tbc.